"Yours Goes to Eleven? Mine Goes to Thirteen"
Ever noticed that your amp sounds amazing when it's turned down low, with silky-smooth cleans and rich distortion, but when you turn the volume up, it all just sounds the same? That's because not all loudspeakers are created equally. So if you like to play it loud and you care about your sound, consider the Electro-Voice EVM12L Zakk Wylde Black Label Guitar Speaker. It's a 300-watt, 12" loudspeaker for guitar that's designed by metalheads for metalheads. The original Electro-Voice EVM12L was an instant hit when introduced in the early '80s. Renowned for its tone, even when pushed to extremely high volumes, the EVM12L quickly became a favorite among metal enthusiasts. Just imagine the beating a speaker cabinet takes after 40 minutes of being on the powered end of an untamed heavy metal rocker's guitar rig. The EVM12L suffers the beating gladly, and dishes it right back out at the audience. 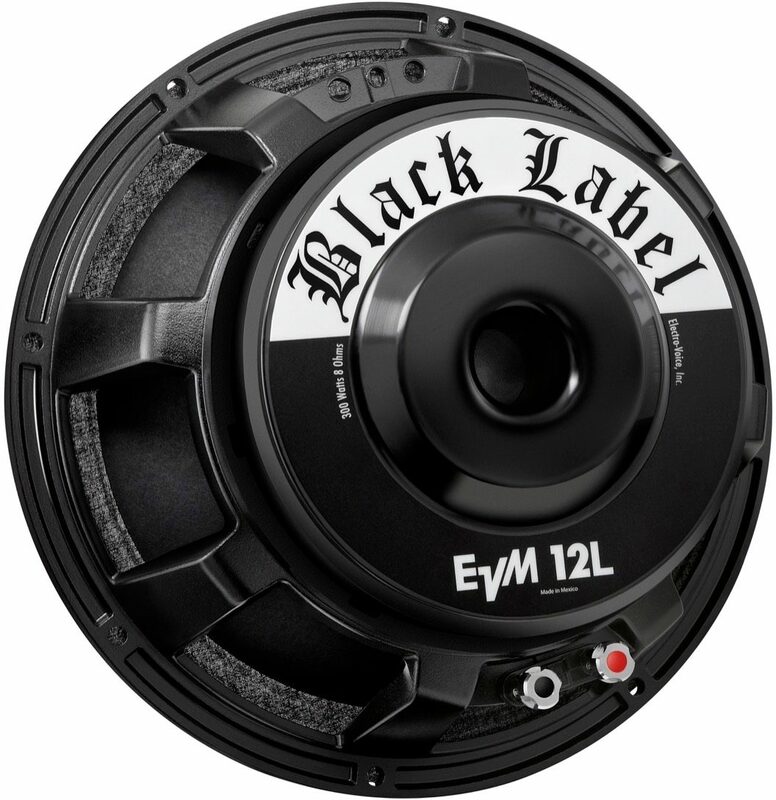 It comes as no surprise that metalhead Zakk Wylde of Black Label Society chose the EVM12L to serve as his personal loudspeaker. Working together, Zakk Wylde and Electro-Voice improved on the original with a new magnet design and better venting. And that's why this speaker comes with no branding other than "Black Label" -- designating it the official loudspeaker of Black Label Society. - Baffle cutout diameter: 11.06"
- Mounting bolt circle diameter: 11.56"
- Frame front diameter: 12.19"
The original EVM12L 12 in. loudspeaker was introduced in 1983. Known for its huge tone, gorgeous low-end and incredible stability at extreme volumes, it quickly achieved legendary status. Top guitarists and bassists loved it not only for its sound, but also for its reliability. Tour after tour, the EVM-12L held up to the demands of the most punishing players. 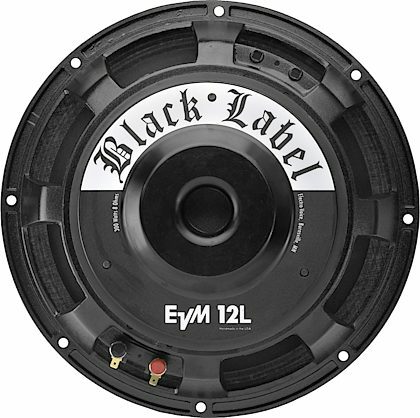 Enter: the EVM-12L Black Label, the official guitar loudspeaker of Zakk Wylde and Black Label Society. Take the EVM-12L, add Zakk's personal specs (improved power handling, improved magnet design, better venting, and th Black Label colors), and now you have the greatest guitar loudspeaker in the world. Wanna argue with Zakk on that? I didn't think so. Remember: The only label is Black. Overall: Purchased 8 of these for my pair of Mesa boogie Rectifier Straight cabinets. The sound is HUGE, tight and focused with unbelievable sustain and low end power. These are mated with my Pair of black faced Mesa Boogie Dual Ractifiers. Overall: WOW! A little context; I have different types of speakers in cabs but mainly use a EVH 5153 4x12 and 2 Orange PPC412's with V30's. As much as I love all of those, today I put two of these in in a 2x12 cab that I had laying around and was just absolutely blown away when I plugged in and heard them for the first time. I did a side by side with the V30's, which I'm a huge fan of, and these were cleaner and have massive, deep and chuggy, smooth yet angry punch! The cleans are clean, the distortion all comes from your amp and not speaker breakup. I just want to play and play to keep hearing how amazing they sound. Every time I play, it's the same excitement I got the first time I heard them. This is the first review I've written on here and I felt compelled because it was almost a religious experience for me. Haha. They are expensive, and my GOD are they heavy as sin when you start adding them together and consider the box, even just two to a 2x12 box, but the sound they push out is second to no speaker I've ever heard personally. I'm no professional but I can't imagine anyone not at least liking these, I love them. If you decide to use them in a 4x12, like myself, get at least two or three roadies to do the lifting.